Both TH2-dependent helminth killing and suppression of the TH2 effector response have been attributed to macrophages (MΦ) activated by IL-4 (M(IL-4)). To investigate how M(IL-4) contribute to diverse infection outcomes, the MΦ compartment of susceptible BALB/c mice and more resistant C57BL/6 mice was profiled during infection of the pleural cavity with the filarial nematode, Litomosoides sigmodontis. C57BL/6 mice exhibited a profoundly expanded resident MΦ (resMΦ) population, which was gradually replenished from the bone marrow in an age-dependent manner. Infection status did not alter the bone-marrow derived contribution to the resMΦ population, confirming local proliferation as the driver of resMΦ expansion. Significantly less resMΦ expansion was observed in the susceptible BALB/c strain, which instead exhibited an influx of monocytes that assumed an immunosuppressive PD-L2+ phenotype. Inhibition of monocyte recruitment enhanced nematode killing. Thus, the balance of monocytic vs. resident M(IL-4) numbers varies between inbred mouse strains and impacts infection outcome. Litomosoides sigmodontis is a rodent filarial nematode which is used to model the host response to infection with filarial parasites of humans such as Onchocerca volvulus and Wuchereria bancrofti (Hoffmann et al., 2000). Infective L3 stage larvae take 3–6 days to migrate from the skin to the pleural cavity, where they remain for the duration of infection. In susceptible BALB/c mice parasites mature, mate and produce microfilariae that circulate in the bloodstream from ~day 55 post infection (pi). In contrast to BALB/c mice, C57BL/6 mice are considered resistant because the number of adult nematodes recoverable from the pleural cavity declines from ~day 22–55 and parasites do not reach sexual maturity or produce microfilariae (Hoffmann et al., 2000; Graham et al., 2005). The absence of IL-4, the central cytokine of type two immunity, renders C57BL/6 mice susceptible to L. sigmodontis infection, with blood microfilariae detectable at day 60 pi (Le Goff et al., 2002). In response to IL-4Rα stimulation MΦ assume an M(IL-4) activation phenotype characterised by the expression of molecules RELMα, YM1 and arginase-1 (Stein et al., 1992; Doyle et al., 1994; Loke et al., 2002; Murray et al., 2014). M(IL-4) have been implicated in nematode killing (Anthony et al., 2006; Zhao et al., 2008; Esser-von Bieren et al., 2013; Bonne-Année et al., 2013) but paradoxically also in suppression of the TH2 immune response (Nair et al., 2009; Pesce et al., 2009b; Pesce et al., 2009a). We have previously reported that IL-4 induces the proliferative expansion of F4/80hi resident MΦ (resMΦ) in the pleural cavity during L. sigmodontis infection, with minimal blood monocyte recruitment (Jenkins et al., 2011; Jenkins et al., 2013). F4/80hi resMΦ of the serous cavities are initially derived from F4/80hi yolk-sac and foetal liver MΦ, prior to the establishment of haematopoietic stem cells (HSCs) which give rise to F4/80lo bone marrow derived MΦ (bmMΦ) (Yona et al., 2013; Schulz et al., 2012; Ginhoux et al., 2010). F4/80hi resMΦ and recently recruited F4/80lo bmMΦ possess distinct M(IL-4) activation profiles upon stimulation with IL-4 (Gundra et al., 2014). MΦ are one of the most abundant cell populations within the pleural cavity during L. sigmodontis infection, yet the composition of the myeloid compartment over the course of infection in resistant and susceptible strains remains unexplored. Consequently, we decided to compare the dynamics of MΦ accumulation during L. sigmodontis infection between C57BL/6 and BALB/c mice. We specifically asked whether differences in MΦ origin, accumulation and activation phenotype correlate with functional consequences regarding parasite clearance and whether these differences could resolve dichotomous functions associated with M(IL-4). We demonstrate striking differences in myeloid cell dynamics between resistant C57BL/6 mice and susceptible BALB/c mice. In particular, the F4/80hi resMΦ population in both naïve and infected C57BL/6 mice was steadily replenished by bmMΦ that assume residency markers GATA6 and CD102. Infection of C57BL/6 mice led to proliferative expansion of the F4/80hi resMΦ population, regardless of origin. In contrast, in BALB/c mice, recently recruited bmMΦ failed to successfully integrate into the resident niche and assumed an PD-L2+ M(IL-4) phenotype that contribute to host susceptibility. Our first objective was to compare the cellular infiltrate in resistant C57BL/6 versus susceptible BALB/c strains across the infection time course. We therefore examined the pleural compartment of infected animals at day 11, 28, 35 and 50 pi. These time points reflected known F4/80hi MΦ proliferation (Jenkins et al., 2011), L4-adult worm moulting (Hoffmann et al., 2000), the peak of cellular accumulation (Babayan et al., 2003) and a final time point prior to microfilarial development (Hoffmann et al., 2000), respectively. As early as day 11 pi there were significantly more cells isolated from the pleural cavity of resistant C57BL/6 mice as compared to susceptible BALB/c mice (Figure 1A). This greater cellularity was due predominantly to significantly higher MΦ numbers along with more B cells (Figure 1A). The remaining infiltrate consisted of neutrophils, T cells and eosinophils (Figure 1—figure supplement 1). Neutrophil numbers were significantly higher in infected C57BL/6 mice at day 28 and 35 pi but represented less than 1% of the total cells. Only eosinophils and T cells were significantly higher in BALB/c mice and only at day 50, a difference likely due to the presence of parasites in BALB/c but not C57BL/6 mice at the later time point. We next assessed the contribution of F4/80hi and F4/80lo MΦ to the increase in total MΦ number. Due to the emergence of a Ly6C+ population within the pleural cavity of infected mice, cells expressing lower levels of F4/80 were further subdivided into F4/80loMHChiLy6C- monocyte-derived macrophages (F4/80lo) and recently recruited F4/80loMHClo-hiLy6C+ monocytes (Figure 1B). Thus, the monocyte gate contained Lin-(CD19, Ly6G, SiglecF, TCRβ), CSF-1R+, F4/80lo, Ly6C+ cells. This gating strategy revealed that the enhanced MΦ number observed in C57BL/6 mice as compared to BALB/c mice was reflective of an expanded F4/80hi population (Figure 1C). There were also more F4/80lo MΦ in the C57BL/6 strain but only at day 11 pi. F4/80lo MΦ numbers did not differ significantly between strains throughout the remainder of the time course (Figure 1C). Notably, although C57BL/6 mice displayed increased numbers of monocytes throughout the infection as compared to their naïve controls, BALB/c mice were marked by a significant influx of Ly6C+ monocytes first observed at day 35 pi (Figure 1C). Thus, the immune response to the parasite in C57BL/6 mice was characterised by increased numbers of F4/80hi MΦ and B cells from day 11 pi. In contrast, susceptible BALB/c mice showed significantly less F4/80hi cell expansion and an influx of Ly6C+ monocytes from day 35 pi. Enhanced F4/80hi MΦ and B cell numbers are associated with resistance. (A) Difference in total exudate cell, MΦ and B cell number between naïve and L. sigmodontis infected C57BL/6 and BALB/c mice at day 11, 28, 35 and 50 pi. MΦ were identified as live, Lin- (CD19, Ly6G, SiglecF, TCRβ) CSF1R+ CD11c-. (B) Representative plots from naïve and infected BALB/c mice at d35 pi, demonstrating the gating strategy used to identify and divide the MΦ population based on expression of F4/80, MHC and Ly6C. (C) Number of F4/80hi, F4/80lo and monocytes isolated from pleural cavity of mice in (A). Presented are the data from two separate time course experiments (day 11 and 28 and day 35 and 50), each of which is representative of three independent experiments with 6 mice/group/time point. *p<0.05, **p<0.01, ***p<0.0001, ****p<0.00001 as determined by a 2-way ANOVA comparing infected C57BL/6 with infected BALB/c mice at each time point. Error bars represent the mean ± SEM. To further characterise the MΦ dynamics in the pleural cavity, we profiled the percentage contribution of F4/80hi, F4/80lo and monocyte populations to the MΦ compartment as a whole within each strain of naïve and infected animals (Figure 2A). In naïve C57BL/6 control mice the F4/80hi population constituted 80–90% of the total MΦ population from 8 to 15 weeks of age (Figure 2B). The remaining 10–20% of the MΦ compartment was composed of F4/80lo MΦ, with almost negligible contribution of monocytes in the C57BL/6 strain (Figure 2B). Interestingly, the proportion of F4/80hi cells contributing to the MΦ pool in naïve C57BL/6 mice declined slightly with age (87 ± 3% to 73 ± 3%) and infection prevented this age-related decline, maintaining the F4/80hi population at ~90% of the total MΦ pool (Figure 2B). Residency is maintained in resistant C57BL/6 mice and lost in susceptible BALB/c mice. (A) Representative FACS plots of MΦ subpopulations from the pleural cavity of naïve and d35 pi C57BL/6 or BALB/c mice. Blue: F4/80hi, Green: F4/80lo, Red: monocytes. Percentage of F4/80hi, F4/80lo and monocytes contributing to the MΦ compartment as a whole in (B) C57BL/6 and (D) BALB/c mice. MΦ expression of GATA6 and CD102 in naïve and L. sigmodontis infected (C) C57BL/6 and (E) BALB/c mice. (A, B, D) Presented are the data from two separate time course experiments (day 11 and 28 and day 35 and 50), each of which is representative of three independent experiments with 6 mice/group/time point. (C and E) Presented are the pooled data from three independent experiments. **p<0.01, ***p<0.0001, ****p<0.00001 as determined by a 2-way ANOVA on each time point. Error bars represent the mean ± SEM. The transcription factor GATA6 and cell surface protein CD102 have been identified as markers of residency expressed by the F4/80hi MΦ population within the peritoneal and pleural spaces of C57BL/6 mice (Okabe and Medzhitov, 2014; Rosas et al., 2014; Bain et al., 2016). Consistent with these reports the F4/80hi population in C57BL/6 mice was positive for GATA6 and CD102 (Figure 2—figure supplement 1) which was reflected in ~80–90% of the total MΦ pool being positive for GATA6 and CD102 at 8 weeks of age or d11 pi (Figure 2C). In naïve C57BL/6 mice, the percentage of MΦ expressing GATA6 was significantly reduced by 15 weeks of age (Figure 2C) reflective of the age-related decline in the proportion of F4/80hi cells (Figure 2B). In contrast, there was no decline in GATA6 within the MΦ compartment of infected C57BL/6 mice and CD102 expression was sustained at a higher level in infected mice (Figure 2C), consistent with maintenance of the F4/80hi phenotype at 90% of the total MΦ pool (Figure 2B). The MΦ dynamics of the BALB/c strain were distinct from the outset, with the F4/80hi population representing 70–80% of the MΦ compartment at 8 weeks of age/day 11 pi, slightly lower than what was observed in the C57BL/6 strain (Figure 2D). A more pronounced decline in the proportion of F4/80hi cells contributing to the total MΦ compartment was observed in both naïve and infected BALB/c mice over the time course. This decline was marked by a corresponding increase in the percentage of F4/80lo MΦ in the cavity (Figure 2D). In contrast to C57BL/6 mice, L. sigmodontis infection in the BALB/c strain did not prevent the age-related decrease in the proportion of F4/80hi cells. In addition, infection induced recruitment of Ly6C+ monocytes from the bone marrow, which further reduced the relative contribution of F4/80hi cells. As a result, by day 50 pi in the BALB/c strain, F4/80lo MΦ and monocytes represent >50% of the myeloid pool (Figure 2D). Consequently, the proportion of myeloid cells expressing residency markers GATA6 and CD102 declined significantly over the time course in both naïve and infected BALB/c mice (Figure 2E). Together these data suggest that the proportion of resident F4/80hi MΦ within the pleural space declines in an age dependent manner and that this decline is more dramatic in BALB/c mice than C57BL/6 mice. Further, infection of C57BL/6 mice but not BALB/c mice was able to prevent the age-related decline of the resident compartment. The stark differences between the two strains in both naïve animals and at day 35 pi was highlighted using dimensionality reduction analysis of multi-parametric flow cytometry in combination with traditional population gating (Figure 2—figure supplement 2). We have previously demonstrated a peak of F4/80hi proliferation in the pleural cavity at day 10 pi with L. sigmodontis (Jenkins et al., 2013). To address whether the enhanced F4/80hi resMΦ numbers at day 35 (Figure 1A) is a result of continued proliferation after d10 pi, we assessed Ki67 expression levels over the infection time course. Cells that exhibit a high level of Ki67 expression after staining with the BD clone B56 have been shown to be actively dividing (Jenkins et al., 2013; Davies et al., 2011). Of the time points measured, F4/80hi resMΦ proliferation peaked above naive levels at day 11 pi only (Figure 3A) and was significantly greater in the C57BL/6 strain compared to BALB/c (Figure 3—figure supplement 1A). Although we only observed Ki67hi staining above background at day 11 (Figure 3A), the F4/80hi MΦ population continued to increase between day 28 and day 35 (Figure 1). Experiments in Ccr2-/- C57BL/6 mice demonstrated that F4/80hi MΦ expansion at d28 pi was not significantly altered making it unlikely that bone marrow derived cells were contributing to the increased numbers (Figure 3—figure supplement 1B and C). We thus hypothesised that additional proliferative bursts between day 11–35 pi would account for this, perhaps in combination with reduced cell death. Measuring proliferation every day would be challenging due to infective larval availability, we therefore decided to use shielded bone marrow chimeras to firmly establish whether the increased F4/80hi population at day 35 and 50 pi was the result of local F4/80hi expansion or recruitment and conversion of monocytes into the F4/80hi pool. Shielding the upper body including the pleural space of CD45.1+/+ C57BL/6 mice from radiation, allows the generation of chimeric mice in which the degree of bone marrow contribution to cells in protected tissues can be determined (Jenkins et al., 2011; Murphy et al., 2008; Bain et al., 2016; Baratin et al., 2017). The proportion of a particular cell population that is bone marrow derived can be calculated by dividing the percentage of donor CD45.2+ cells in the tissue of interest with that observed in blood Ly6Chi monocytes. Full bone marrow replacement will show equivalent chimerism with the blood (Figure 3—figure supplement 2). Because of the need to recover from irradiation, mice were on average 9 weeks older than those in the experiments described above. Local proliferation accounts for enhanced F4/80hi cell number in resistant C57BL/6 mice. (A) Expression of high levels of Ki67 by pleural F4/80hi MΦ from naïve (grey bars) or infected (black bars) C57BL/6 mice at d11, d28, d35 and d50 pi. (B) Percentage of Bone Marrow Derived (BMD) cells contributing to F4/80hi population at d35 and d50 pi in naïve and L. sigmodontis infected partial bone marrow chimeric C57BL/6 mice. (C) F4/80hi cell number at d35 and d50 pi from animals in (B). (D and E) Expression of GATA6 and CD102 by host/donor derived F4/80hi MΦ at d35 and d50 pi (F) expression of TIM4 by F4/80hi MΦ at d35 and d50 pi in naïve and L. sigmodontis infected partial bone marrow chimeric C57BL/6 mice (G) Expression of TIM4 at d35 and d50 pi. Data in (A) is the representative of 3 experiments with 6 mice per group, data in (B–D) are representative of two independent experiments with 10 mice/group/time point. ***p<0.0001 as determined by a 2-way ANOVA on each time point. Error bars represent the mean ± SEM. We were initially surprised to find that ~50% of the F4/80hi population was derived from the bone marrow by 23 weeks of age in naïve and infected animals at day 35 pi. Over the next two weeks chimerism increased further to ~80% (Figure 3B). Critically, despite near identical chimerism between infected and naïve mice at both day 35 and day 50, infected mice possessed a MΦ population size that was 27-fold larger (Figure 3C). Thus the increased contribution of bmMΦ to the F4/80hi pool was an age related phenomena, the rate of which was not accelerated by nematode infection. This data is supported by the findings of Bain et al., 2016 showing a gradual replenishment of the pleural F4/80hi population by bmMΦ with age (Bain et al., 2016). In that study, the level of bone marrow cell contribution to the pleural MΦ compartment is ~50% by 19 weeks of age. In our experiments, experimental mice were approximately 18 weeks of age at the time of infection. Thus by the time the mice were infected with L. sigmodontis, a substantial proportion of the F4/80hi population had already been replenished from the bone marrow. Because the ratio of recruited to resident is identical in naïve vs infected animals, throughout the infection time course, the far greater resMΦ numbers in C57BL/6 mice are not due to infection-driven recruitment of bone-marrow derived cells. Instead, higher F4/80hi numbers presumably result from in situ proliferation of the resMΦ population in infected mice regardless of origin. All of F4/80hi MΦ were positive for residency markers GATA6 and CD102 (Figure 2—figure supplement 1). 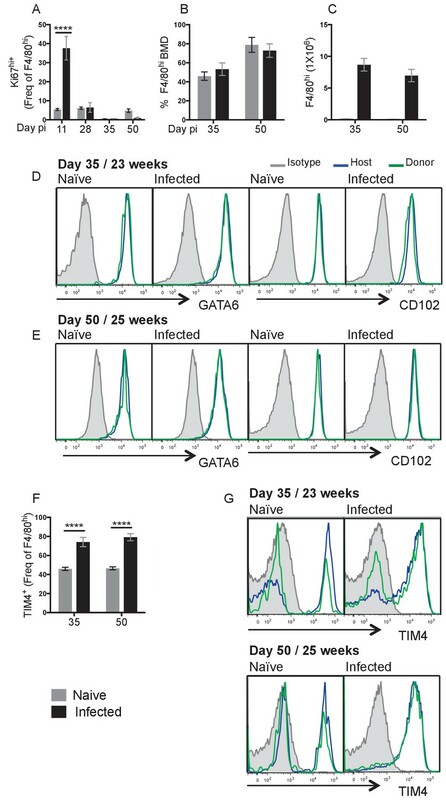 Comparison of GATA6 and CD102 expression by donor- and host-derived F4/80hi MΦ within naïve and infected C57BL/6 mice revealed that donor-derived cells were equally capable of expressing these residency markers as host-derived cells (Figure 3D and E, Figure 3—figure supplement 2C–E). Thus successful integration of bmMΦ cells into the resMΦ niche is exemplified by expression of GATA6 and CD102, a process that is not altered by infection. The situation was different for Tim4, also considered a marker of resident F4/80hi MΦ within the pleural space (Davies et al., 2011). Unlike GATA6 and CD102, which uniformly marked the F4/80hi population, only 46 ± 1.6% of the F4/80hi population was TIM4+ in naïve animals aged 23–25 weeks (Figure 3F). In naïve controls at 25 weeks of age, an equal proportion of donor and host F4/80hi cells were negative for Tim-4. This data is consistent with the finding of Bain et al., 2016 that even long-lived bone marrow derived cells do not universally take on Tim4 expression in the steady state (Bain et al., 2016). The striking result here was that L. sigmodontis infection induced TIM4 expression on the F4/80hi population, with 76 ± 4% staining TIM4 positive at day 35 and 50 pi (Figure 3F), and by day 50 Tim4 expression more closely resembled that of GATA6 and CD102 with the majority of both donor and host F4/80hi cells expressing Tim4 (Figure 3F&G). The data suggest that Tim4, both in the steady state but particularly during infection is not a reliable marker of MΦ origin. Bain et al., 2016 have recently highlighted that in naïve mice RELMα is expressed by bone marrow precursors (F4/80loMHCII+CSF1R+) to the F4/80hi resMΦ pool and that RELMα transiently marks cells of monocytic origin. Consistent with this finding, we observed ~60 and~80% of the F4/80lo MΦ were RELMα positive in naïve C57BL/6 and BALB/c mice respectively, while ~10% and ~50% were RELMα positive in the respective F4/80hi populations (Figure 4A). This data along with dimensionality reduction analysis of multi-parametric flow cytometry (Figure 2—figure supplement 2) illustrated fundamental differences in the dynamics of incoming cells between the strains. Downregulation of RELMα may be part of the process by which F4/80loMHCII+CSF1R+MΦ convert to F4/80hi resMΦ in naïve animals. If so, the higher RELMα positivity within the F4/80hi population of BALB/c mice may reflect a relatively poor ability of BALB/c mice to promote bmMΦ integration into the resMΦ niche. However, upon infection of both strains almost all MΦ regardless of phenotype expressed RELMα (Figure 4A; Figure 2—figure supplement 2), a reflection of the ability of IL-4Rα signaling to induce RELMα expression independent of strain or origin (Jenkins et al., 2013). RELMα was therefore not a useful marker of monocytic origin in the context of type two immunity. PD-L2+ MΦ are associated with susceptibility. Expression of (A) RELMα or (B) PD-L2 by F4/80hi, F4/80lo and/or monocyte populations isolated from naïve and L. sigmodontis infected C57BL/6 and BALB/c mice at day 50 pi. (C) The number of CD4+ T cells and percentage of CD4+ T cells expressing GATA3, IL-4, (D) IL-5 and IFNγ within the pleural cavity (PC) of mice in (A). (E) Correlation between percentage of PD-L2 positive MΦ and worm recovery rate. Data in (A,C,D) are representative of three independent experiments with 6 mice/group, data in (B) is representative of two independent experiments. *p<0.05, **p<0.01 (Non-parametric Kruskal-Wallis test preformed followed by Mann–Whitney for pairwise comparison). Bars represent the median. Like RELMα, the immunosuppressive molecule programmed cell death ligand 2 (PD-L2) is induced by IL-4 but in contrast to RELMα, is preferentially expressed by F4/80lo M(IL-4) (Gundra et al., 2014). In addition, PD-L2 is permanently downregulated by F4/80lo M(IL-4) upon integration into the resident pool even in the face of subsequent IL-4Rα signaling (Gundra et al., 2017). We therefore assessed the expression of PD-L2 at day 50 pi in both resistant C57BL/6 and susceptible BALB/c mice. PD-L2 expression was upregulated by all MΦ sub-populations of infected BALB/c mice compared to naïve controls (Figure 4B) whereas infected C57BL/6 mice exhibited significantly lower frequencies of PD-L2+ MΦs relative to BALB/c mice (Figure 4B). Indeed, there was negligible detection of PD-L2 expression by the F4/80hi population of C57BL/6 mice at day 50 pi (Figure 4B), despite being ~80% bone marrow derived (Figure 3B). This provides additional evidence that successful integration into the resident niche results in an inability to upregulate PD-L2 in response to helminth infection, consistent with recent findings (Gundra et al., 2017). Thus, PD-L2+ cells within the F4/80hi population of infected BALB/c mice supports a model of inefficient integration of bmMΦ into the resMΦ niche in this strain. PD-L2 has specific relevance to L. sigmodontis, where its ligand PD-1 is highly expressed on TH2 cells during chronic infection of susceptible BALB/c mice. In this setting, PD-1/PD-L2 interaction induces a state of TH2 cell-intrinsic hypo-responsiveness that is characterised by significantly diminished production of TH2 signature cytokines IL-4 and IL-5 (van der Werf et al., 2013). To assess if the enhanced recruitment and subsequent M(IL-4) activation of F4/80lo MΦ and monocytes was contributing to susceptibility through the induction of hypo-responsive TH2 cells, the strength of the immune response was analysed at day 50 pi in both resistant C57BL/6 and susceptible BALB/c mice. Expression of the TH2 master transcription factor GATA3 was significantly greater in CD4+ T cells isolated from the pleural cavity of C57BL/6 mice compared with BALB/c (Figure 4C) although no significant difference in expression of IL-4 or IL-5 by GATA3+CD4+ cells was detected (Figure 4C and D). 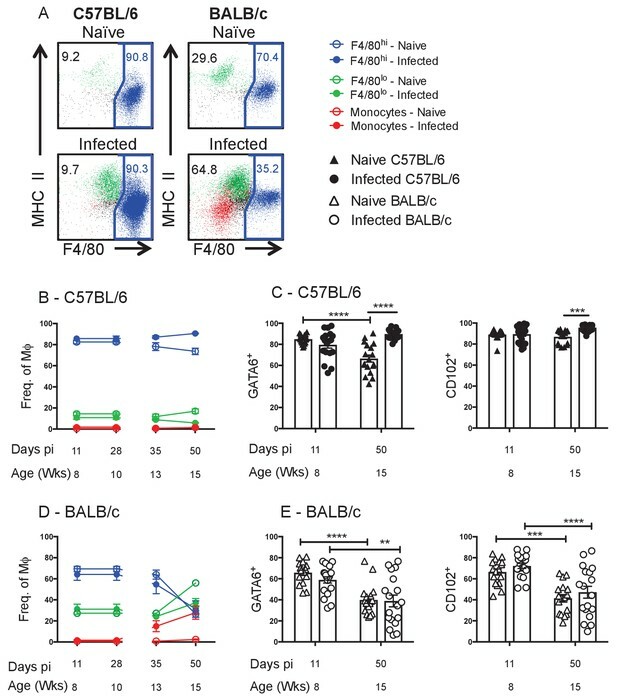 Interestingly however, there was a significantly greater proportion of IFN-γ producing CD4+ cells from infected BALB/c mice compared to C57BL/6 mice (Figure 4D). Notably, there was a strong positive correlation between the percentage of PD-L2+ MΦ and worm recovery rate (Figure 4E). The data thus far suggested that in BALB/c mice recruitment of bmMΦ was detrimental to parasite killing. To test this hypothesis we used a monocyte depleting anti-CCR2 antibody to block monocyte recruitment in BALB/c mice prior to the peak of monocyte influx. Anti-CCR2 was administered daily from day 31–34-post infection and PLEC were examined at day 35 pi (Figure 5A). Antibody treatment in this time frame successfully prevented the influx of monocytes into the pleural cavity, resulting in the F4/80hi population representing ~80% of the total MΦ compartment (Figure 5B). Inhibiting monocyte infiltration resulted in significantly increased worm killing in the normally susceptible BALB/c mice (Figure 5C). In the anti-CCR2 treated group 29% of the mice had no parasites compared to 5% in the rat IgG treated group, a striking effect given the BALB/c mice typically have not cleared the infection until ~day 90 pi. Anti-CCR2 treatment did not affect the number of F4/80hi MΦ in the cavity, but significantly reduced F4/80lo MΦ and depleted monocytes (Figure 5D). The difference in parasite killing could not readily be attributed to PD-L2, however, as there was no significant difference in the percentage or number of PD-L2+ MΦ between anti-CCR2 treated and Rat IgG treated controls at this time point (Figure 5E and Figure 4—figure supplement 1). While no difference was detected in the number of pleural cavity CD4+GATA3+ TH2 cells between control and monocyte depleted mice (Figure 5F), the proportion of CD4+GATA3+TH2 cells producing IL-4 in monocyte depleted mice was significantly enhanced (Figure 5F). The frequency of IL-5+ and IFN-γ+ cells were not significantly altered (Figure 5F). Recently recruited MΦ are detrimental to worm killing. (A) Experimental scheme. (B) Contribution of F4/80hi, F4/80lo and monocytes to the MΦ compartment of L. sigmodontis infected BALB/c mice after treatment with either Rat IgG (circles) or anti-CCR2 (squares). (C) Worm recovery rate at day 35 pi following 4 days of either control rat IgG or α-CCR2 administration i.p. in susceptible BALB/c mice. (D) Pleural F4/80hi, F4/80lo, monocyte numbers. (E) Percentage of MΦ expressing PD-L2. (F) Total number of pleural cavity GATA3+CD4+ T cells, percentage GATA3+CD4+ expressing IL-4 or IL-5 and IFNγ expression by CD4+ cells. (C and D) *p≤0.05, ****p≤0.0001, as determined by an ANOVA using combined data from three experiments with 5, 10 and 6 mice/group (F) *p≤0.05 determined by an ANOVA using data combined from two experiments with 10 and 6 mice/group (p<0.05, Tukey’s HSD). Through comparison of resistant and susceptible strains during filarial infection we demonstrate that dichotomous functions attributed to M(IL-4) may be explained by whether a MΦ possesses a recently recruited bmMΦ or resMΦ phenotype upon IL-4Rα stimulation. We also highlight striking differences in the dynamics of serous cavity MΦs between two commonly used laboratory mouse strains. Resistance against L. sigmodontis in C57BL/6 mice was associated with the predominance of an M(IL-4) F4/80hiGATA6+CD102+ resMΦ population that accumulated through proliferation of the existing population. The resMΦ phenotype within the serous cavities is in part determined by the retinoic acid-dependent master transcription factor GATA6 and additional retinoic acid independent genes such as CD102 (Okabe and Medzhitov, 2014; Rosas et al., 2014; Bain et al., 2016). Here we show that bmMΦ successfully integrated into the resMΦ niche, as defined by GATA6 and CD102 expression in both naïve and infected animals. This data re-enforces the finding that resMΦ of the serous cavity are replenished from the bone marrow in an age-dependent manner (Bain et al., 2016). We further show that despite a dramatic increase in MΦ number within the cavity as well as infection-dependent changes in phenotype, helminth infection does not alter the homeostatic rate of age-dependent replenishment. The data suggests that regardless of the size of the macrophage pool inherent differences in proliferation, survival and death between long-term and recent entrants into the resident pool can maintain the ratio of bone-marrow to embryonically-derived cells in the pleural cavity (Supplementary file 1). Resistance was also associated with a greater degree of pleural B cell accumulation. B cells and their antibody products play a central role in anti-nematode immunity (Esser-von Bieren et al., 2013; Rajan et al., 2005; Carter et al., 2007) and we recently reported that during primary L. sigmodontis infection, pleural cavity B cells proliferate and produce antigen-specific IgM (Jackson-Jones et al., 2016). Collaboration between MΦ and antibodies to trap and kill invading larvae has been demonstrated during secondary H. polygurus infection (Esser-von Bieren et al., 2013). Experiments in a related model of filarial nematode infection in the peritoneal cavity demonstrate that resident MΦ actively contribute to larval death (unpublished data). Consequently, we hypothesise that local IgM and MΦ together function in granuloma formation, eventually leading to death of the L. sigmodontis worm in resistant C57BL/6 mice. Susceptibility in the BALB/c strain was marked by significantly less F4/80hi macrophage proliferation. Additionally, the F4/80hiGATA6+CD102+ resMΦ population within both naïve and infected BALB/c mice diminished with age while the percentage of bmMΦ contributing to the MΦ compartment increased. Such dynamics are suggestive of an inability of influxing bmMΦ to integrate into the resMΦ niche of BALB/c mice and could reflect a deficit in local retinoic acid. Indeed a recent study has highlighted the inability bmMΦ to integrate into the resMΦ niche of C57BL/6 mice on a Vitamin A deficient diet (Gundra et al., 2017). Alternatively bmMΦ in BALB/c mice may be transcriptionally silenced at the GATA6 locus as has been noted for thioglycollate elicited MΦ (Okabe and Medzhitov, 2014). Infection in the BALB/c strain was also marked by an influx of Ly6C+ monocytes by day 35 pi. resulting in a large proportion of the myeloid compartment possessing a recently recruited F4/80loMHCIIhi phenotype by day 50 pi. Because these cells preferentially express PD-L2 (Gundra et al., 2014), there was also a greater degree of PD-L2 expression upon M(IL-4) activation. Monocyte depletion prior to day 35 pi revealed an immunosuppressive role for monocytes and F4/80lo M(IL-4) during L. sigmodontis infection, with an enhanced TH2 profile. While our data demonstrate a role for the incoming monocytes in the susceptibility of BALB/c mice, we are not asserting that differences in monocyte recruitment are the sole reason for differences in strain susceptibility. We hypothesise that susceptibility in the BALB/c strain arises from a combination of factors, beginning with a failure to generate resMΦ and B cell numbers equivalent to that seen in the resistant strain. Secondarily, we hypothesize that this deficit in resMΦ and B cells is confounded by an influx of bone-marrow derived macrophages which assume an immunosuppressive PD-L2+ phenotype which fail to integrate into the resident niche, thereby affecting the ability of MΦ to function in an anti-helminthic manner. A role for PD-L2 expressing cells in mediating susceptibility in BALB/c mice during L. sigmodontis infection has already been demonstrated (van der Werf et al., 2013) and the immunosuppressive monocytes we observe likely contribute to the T regulatory response that is important for susceptibility to L. sigmodontis (Taylor et al., 2005; Taylor et al., 2007; Taylor et al., 2009). Notably, the effects of Treg depletion while significant are similarly modest to the effects seen here with monocyte depletion further suggesting that Treg expansion and immunosuppressive monocytes are not alone responsible for susceptibility. It is notable that a similar influx of monocytes that mature into PD-L2+ bmMΦ is seen in the liver of S. mansoni infected mice (Pearce and MacDonald, 2002; Nascimento et al., 2014; Gundra et al., 2014). While depletion of this immunosuppressive bmMΦ population during S. mansoni infection results in an enhanced TH2 immune response it is also marked by reduced granuloma formation and severely exacerbated disease (Nascimento et al., 2014). A direct host-protective role of these cells is illustrated in a study whereby PD-L2+ bmMΦ isolated from T. crassiceps infected mice reduce the disease burden during experimental autoimmune encephalitis (Terrazas et al., 2017a). In both studies the immunosuppressive impact of PD-L2+ bmMΦ were observed late in infection. Although PD-L2 inhibits protective immunity to L. sigmodontis (van der Werf et al., 2013), we were unable to demonstrate that the immunosuppressive capacity of bone-marrow derived M(IL-4) at this time point was due to PD-L2, and suspect that day 35 is too early to see a PD-L2 dependent effect. Whether eventual parasite death within the BALB/c strain results because of a decline in immunosuppressive bmM(IL-4) or successful integration of these cells into the resMΦ niche remains to be explored. Indeed, as S. mansoni infection progresses, PD-L2+ bmMΦ integrate into the resident niche enabling disease resolution. In the absence of vitamin A, integration into the resident niche is inhibited and enhanced mortality pursues (Gundra et al., 2017). Together with our data these studies suggest that monocyte-derived macrophages are critical regulators of host immunity, which can tip the fine balance between infection control and host damage. As such we hypothesise that bmMΦ upon infiltration into an inflammatory milieu containing IL-4 take on an immunosuppressive phenotype, to prevent self-damage associated with more classical inflammatory pathways. Of note, similar differences in monocyte recruitment might contribute to susceptibility and resistance between BALB/c and C57BL/6 mice to Leishmania donovani. A recent publication by (Terrazas et al., 2017b) demonstrated that CCR2 dependent monocytes contributed to host susceptibility in BALB/c mice. In contrast, Sato et al., 1999 found no role for CCR2 in mediating resistance in C57BL/6 mice, suggesting that the difference we observed here may be a fundamental difference between these strains that goes beyond helminth infection. Female BALB/c mice, congenic CD45.1+/+ / CD45.2+/+ C57BL/6 mice, and Ccr2-/-mice were bred in house and maintained in specific pathogen free (SPF) facility at the University of Edinburgh. Ccr2-/-mice were originally sourced from Jackson Laboratories (C57BL/6 Ccr2tm1lfc). Experimental animals were 6–8 weeks of age at the beginning of the experiment, unless otherwise stated. Age matched female mice were randomly allocated into naïve and infected groups on day 0 of an experiment. Naïve and infected mice were housed in separate individually ventilated cages. Sample size was calculated on the basis of the number of animals needed for detection of a change in macrophage proliferation of 50% at a P value of < 0.05, using our experience with the L. sigmodontis model (Jenkins et al., 2011; Jenkins et al., 2013). Due to the inherent biological variation in the parasite lifecycle, the number of available infective nematode larvae determined the number of time points that could be examined in a single experiment. Experiments were in accordance with the United Kingdom Animals (Scientific Procedures) Act of 1986 and approved by the University of Edinburgh Animal Welfare and Ethical Review Body. CD45.1+/+ C57BL/6 females were anaesthetized and their lower limbs exposed to 9.5 Gy γ-irradiation. The upper body, including the pleural cavity was protected by a two inch lead shield. Partially irradiated animals were administered 4.55 × 106 CD45.2+/+ bone marrow cells intravenously. Recipient mice were allowed to recover for 8 weeks prior to L. sigmodontis infection. L. sigmodontis infective stage 3 larvae (L3) were isolated from the mite vector Ornithonyssus bacoti. Thirty L3s suspended in 200 μl RPMI (5% horse serum) were then injected subcutaneously into the scruff using a 23G needle. Pleural exudate cells (PLEC) were obtained through washing the pleural cavity with 10 ml RPMI supplemented with penicillin-Streptomycin (1%) and L-Glutamine (1%). Samples were kept on ice and contaminating erythrocytes were lysed prior to cell counting with a Nexcelom cell counter. Pleural cells (5 × 105/100 μl or 1 × 106/200 μl) were washed twice in PBS, stained with LIVE/DEAD (Invitrogen, Carlsbad, CA) and blocked with 0.025 μg anti-CD16/32 (2.4G2: Biolegend, San Diego, CA) and 1:100 heat-inactivated mouse serum (Invitrogen) prior to surface staining; CD19 (6D5), Ly6G (1A8), SigLecF (E50-2440), TCRβ (H57-597), MHC class II (M5/115.15.2), F4/80 (BM8), Ly6C (HK1.4), CD115 (AFS98), CD11b (M1/70), CD11c (N418), CD102 (3C4(MIC2/4)), PD-L2 (TY25), CD4 (GK1.5). Samples were washed, permeabilized overnight (FoxP3/Transcription Factor Staining Buffer Set, eBioScience, San Diego, CA) and stained for intracellular marker GATA6 (D61E4), Ki67 (REA183), GATA3 (REA174), IL-4 (11B11), IL-5 (TRFK5), IFNγ (XMG1.2), YM1 (DY2446, R&D Systems, Wiesbaden, Germany) or RELMα (PeproTech, Rocky Hill, NJ). Where necessary samples were stained with streptavidin and anti-rabbit conjugated fluorochromes. Cells were acquired using the FACS LSR Fortessa with FACSDiva software. FlowJo version nine software was used for data analysis. For dimensionality reduction analysis of monocyte/macrophage populations, pleural cavity cells from day 35-infected and naïve mice were stained as above. Using Flowjo, lineage negative, CD11b+cells were concatenated and exported from 5 mice per group and down-sampled to 10,000 cells. tSNE and PCA dimensionality reduction using 13 parameters, (Ly6C, YM1, CD11b, CD115, PDL-2, GATA6, TIM4, RELMA, MHC-II, CD11c, F4/80 forward-scatter area and side scatter area) was performed using the Bioconductor R package, Cytofkit and FCS files were exported for analysis in FlowJo. Statistical significance on data from naïve and infected C57BL/6 and BALB/c mice, was carried out using a two way-ANOVA. When data was combined from multiple experiments, experimental effects were controlled for in the analysis. Where a dataset failed to meet the requirements for a parametric test, comparison was performed with a non-parametric unpaired Mann-Whitney-Wilcoxon. GraphPad Prism v6.0 and JMP version 12 were used for the statistical tests. One animal was excluded from the cytokine analysis graphs of Figure 4. The majority of cells from this sample were dead post PMA + Ionomycin restimulation, as evidenced on the flow cytometer by ~531 CD4+GATA3+ events compared with ~5000 events in other samples. A threshold was set at 1000 events because with fewer events the percentages were not representative. The Journal of Immunology 178:5116–5123. European Journal of Immunology 41:2155–2164. European Journal of Immunology 24:1441–1445. International Journal for Parasitology 32:1277–1284. The Journal of Immunology 166:4697–4704. American Journal of Respiratory Cell and Molecular Biology 38:380–385. The Journal of Experimental Medicine 206:937–952. The Journal of Immunology 175:1827–1833. Journal of Experimental Medicine 176:287–292. The Journal of Immunology 179:4626–4634. The Journal of Immunology 174:4924–4933. European Journal of Immunology 39:192–206. Thank you for submitting your article "Myeloid cell recruitment versus local proliferation differentiates susceptibility from resistance to filarial infection" for consideration by eLife. Your article has been reviewed by 3 peer reviewers, and the evaluation has been overseen by a Reviewing Editor and Michel Nussenzweig as the Senior Editor. The following individual involved in review of your submission has agreed to reveal his identity: Steffen Jung (Reviewer #1). In this work, killing of filarial nematodes the pleural space in dependence of IL-4 activated macrophages (MΦ) was investigated in two mouse strains with graded susceptibility. The investigators show that MΦ proliferation in situ was a dominant cause of MΦ expansion in infected resistant B6 mice. In contrast, BALB/c mice showed a reduced population of resident MΦ, but an increased influx of immunosuppressive PD-L2+ monocytes, which inhibited parasite killing. 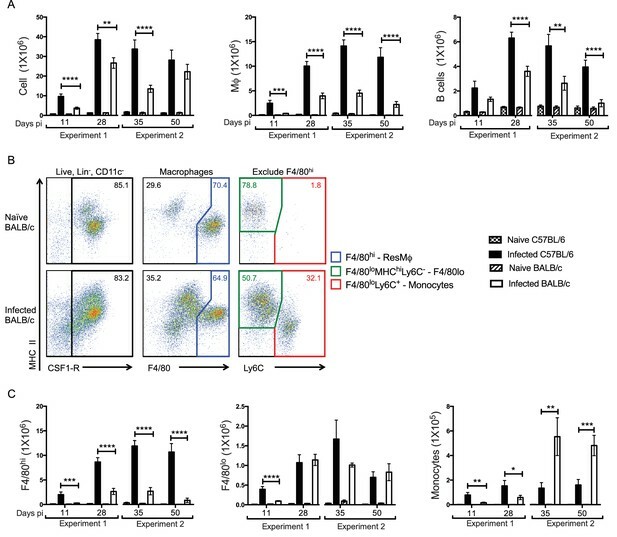 Overall, this is very interesting work providing in vivo evidence that the myeloid cell composition in the pleural space is essential for parasite killing, and that incoming monocytes impair resistance. It is particularly interesting that BALB/c mice fail to integrate bone-marrow derived MΦ into the residency pool. The presented experiments are convincing and scientifically sound. The paper does not provide a clear-cut mechanism by which the differential representation of the two macrophage populations (F4/80 high vs. low) mediates resistance and susceptibility to infection, respectively. The study remains correlative and does not offer any data on effector functions of the two macrophage populations. Also, the work does not exclude the possibility that the differential outcome of infection is related to indirect/secondary effects of the macrophage populations. The putative direct impact of the macrophage populations on the protective Th2 response remained rather weak and is unlikely to fully explain the differential clinical phenotype of BALB/c and C57BL/6 mice. These alternative options should be discussed. 1) The phenotypic differences between B6 and BALB/c mice are complex due to the different development of the parasites in these mice. As outlined in the Introduction, in susceptible BALB/c mice, microfilariae are produced and circulate in the bloodstream of B/c mice starting at 55 days post infection. In contrast to BALB/c mice, microfilariae are not produced in B6 mice. The differences between the mouse strains in the pleural macrophage dynamics are striking. Yet, I am not fully convinced that the late monocyte influx in BALB/c mice is the major difference between the mouse strains, since the effect of the CCR2 mAb is rather modest. Furthermore, the paper would be stronger, if effects were always shown site by site between the strains. 2) The dynamics in total pleural cell numbers in infected mice can only partially be explained by changes in the myeloid cells and B cells. As an example at day 28, macrophages, monocytes and B-cells sum up to around 7 x 106 out of 20 x 106 cells. What are the other cells? 3) I am missing monocyte subset definition. Are all monocytes Ly6Chi? 4) Please show neutrophil influx during infection: less than 1% of cells correspond to the monocyte influx early in infection. 5) The expression of CD102 and GATA6 is hard to grasp from the provided data. Please provide original dot blots of day 50 mice with and without infection (supplementary data). 6) The data presented in Figure 3 are incomplete, i.e. not conclusive in the current form. The kinetics of Ki67 staining does not follow that of the cellular expansion. Please provide additional data, in particular BrDU staining. 7) The half-life of pleural MΦ in the bone marrow chimeras is not plausible. The half-life is around 13 weeks at day 35 (8 weeks resting plus 5 weeks experiment), but 2 weeks between day 35 and day 50. How is that? 8) Figure 3D and E: Please show original dot blots in the supplement. 9) Figure 4.: Whereas the data on PD-L2+ monocytes are intriguing, the interpretation of the T-cell data is not acceptable. Please remove the statement on a “slight trend", there is no difference in T-cells, IL5+CD4+ cells and GATA3+ CD4 cells between the strains. 10) The numbers of mice from the same condition differ between the panels, e.g. Figure 4: 5 or 6 infected BALB/c mice? Why is this? Please explain in detail. 11) Figure 5. Please eliminate the statement on a trend (see above). 12) Statistics: Please prove normal distribution of values or use a non-parametric test. In this regard I am particularly doubtful about Figure 5C! In the same panel: If the authors wish to show that more mice with intervention than with the control cleared the infection – as elaborated in the text – a completely different analysis is required. Otherwise, please remove the statement and adjust the statistics. 13) Figure 1: The authors state that the presented data are pooled from two separate time course experiments (day 11 + 28 and day 35 + 50). However, the data are presented as continuous line graphs, which should only be used if all data points are from one time course experiment. Please change into bar graph and explicitly label column 1 + 2 as "experiment 1" and column 3 + 4 as "experiment 2". 14) It remains unclear from the text and Figure 3—figure supplement 2A and B, why the authors chose a partial irradiation of the mice, in which not only the chest and abdomen, but also the upper extremities were protected against irradiation. Essentially, this means that the recipient mouse has quite significant residual bone marrow activity, as hematopoiesis is not restricted to long bones of the lower extremities and also take places in the upper extremities, sternum, pelvis etc. In order to calculate the contribution of bone derived-macrophages vs. resident tissue macrophages to the cellular exudates in the pleural cavity, it would have been sufficient to shield the chest alone in order to minimize bone marrow activity derived from the recipient; the donor (BM-derived) and recipient (tissue-resident) macrophages can be distinguished just by the congenic CD45 alleles. As it stands, the authors need to better specify and explain the contribution of CD45.2+ (derived from donor bone marrow) and CD45.1+ macrophages (derived from residual recipient bone marrow) to the macrophage pool in the pleural space. Most importantly, the authors wanted to establish, whether the increased F4/80high population at day 35 and 50 post infection was the result of local F4/80high proliferation or of a recruitment and conversion of monocytes into the F4/80high pool (subsection “Resistant C57BL/6 mice maintain the F4/80hi resMΦ population”, first paragraph). There is no clear answer to this question in this subsection, and probably also not possible due to the fact that recipient bone-marrow-derived macrophages expressing high amounts of F4/80 cannot be distinguished from F4/80high macrophages derived from the resident tissue macrophage population. 15) Has it ever been tested whether the resident tissue macrophages in the pleural space are radiosusceptible or radioresistant? We are in agreement with the reviewer. This is a highly complex chronic infection with a metazoan parasite. It is certain that multiple factors contribute to resistance or susceptibility and we do not believe a single cellular population can explain susceptibility. Indeed, previous papers demonstrating a significant role for Treg cells in susceptibility to L. sigmodontis similarly do not show dramatic changes – nonetheless they are significant and consistent effects [1-3]. We hypothesize that susceptibility in the BALB/c strain arises from a combination of factors, beginning with a failure to generate resMΦ and B cell numbers equivalent to that seen in the resistant strain. Secondarily, we hypothesize that this deficit in resMΦ and B cells is confounded by an influx of bone-marrow derived macrophages which assume an immunosuppressive PD-L2+ phenotype and fail to integrate into the resident niche, thereby affecting the ability of MΦ to function in an anti-helminthic manner. A clear role for PD-L2 expressing cells in mediating susceptibility in BALB/c mice during L. sigmodontis infection has already been demonstrated . Critically, we are not asserting that differences in monocyte recruitment are the most important or sole reason for differences in strain susceptibility. We have worked to clarify the text in the Discussion to make this distinction clear and highlight the concept that multiple cell types must be contributing to resistance vs. susceptibility. Nonetheless, the manuscript does highlight real differences between resident and monocyte-derived cells in a relevant infection model. We further believe the great strength of the manuscript is in demonstrating that different genotypes exhibit very different myeloid recruitment/proliferation dynamics with an impact on infection outcome. We are not certain what is being requested here. The only site in the paper is the pleural cavity. If the referee meant side by side, we believe that we have done this. We have made it clearer in the text and figure legend that each figure is referring to the pleural cavity. This is a very relevant question and we apologise that we did not make this clearer. All of the populations contributing to total cell number are now represented in Figure 1—figure supplement 1. We had originally stated ‘Neutrophils were also significantly higher in C57BL/6 mice at d28 and d35 but represented less than 1% of the total population, while T cells and eosinophils did not differ significantly between strains (data not shown)’. However, we appreciate it was not clear that eosinophils, T cells and neutrophils constitute the remainder of the total cell number. Consequently, along with the new supplemental figure, we have edited the text to more clearly convey the contribution of different cell types to the total pleural cell numbers. To further clarify the cell populations including Ly6Chi expression, we are including multi-parameter flow cytometric data from a recent repeat of L. sigmodontis infection at Day 35. The Allen lab has moved from Edinburgh to Manchester and despite the change in animal unit and experimenter, the data has been highly repeatable. Indeed, the consistency of the findings is remarkable. We include the data as supplemental because the experiment was only performed once. Dimensionality reduction analysis of the flow cytometry data further illustrates the dramatic differences between the two strains, both in the steady state and at each infection time point (Figure 2—figure supplement 2). The neutrophil data can now be found in Figure 1—figure supplement 1. The original dot plots of CD102 and GATA6 expression by the total MΦ population both in the presence and absence of infection were included in Figure 2—figure supplement 1. However, we recognize now that the labeling and layout of this figure was ambiguous. 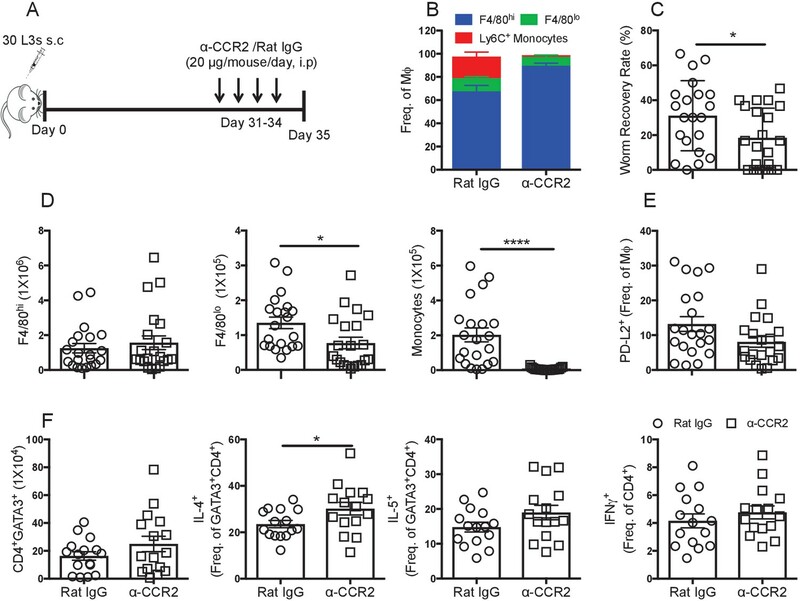 Figure 2—figure supplement 1 has been updated to more clearly illustrate the expression of GATA6 and CD102 by the total macrophage population and the F4/80hi population in both strains in naïve animals and at day 11 and day 50 pi. We presume the referee is suggesting that we are missing proliferation by using ki67hi+ staining rather than BrDU. We do not believe this is the case. We have extensively verified that gating on Ki67hi cells using BD clone BV56 (and only this clone), specifically marks cells actively in cell cycle, overlapping with BrDU staining following a 3 hour pulse. This was shown in our original J. Exp. Med and Science papers describing proliferation in this nematode model [5,6] and subsequently in our more recent Science paper where it can be clearly seen that all BrdU+ cells are contained within the Ki67hi population. Please see Suppl. Figure 3C: www.sciencemag.org/content/356/6342/1076/suppl/DC1. The validity of using Ki67hi has been further confirmed independently by Phil Taylor  using pHH3 staining, which provides a definitive marker of proliferative events. Of course, this does not resolve the concern of the referee about the apparent disconnect between the proliferation we observe and cellular expansion, as the increased number of F4/80hi cells at day 28 and 35 could not be explained by Ki67hi staining at these time points. Based on our experience with this model in which we have observed small proliferative resurgences, we assumed that proliferation occurred outside the time points examined. However, a detailed time course to identify transient proliferative peaks between day 11 and 35 post infection is not practical in terms of parasite availability or cost. It was exactly for this reason that we generated shielded bone marrow chimeras. The use of the bone marrow chimeras allowed us to establish definitively whether the increase in number was due to local expansion or recruitment of bone marrow-derived cells. This is a well-established technique for this purpose [5,8-10]. We have now included data from CCR2 deficient mice(Figure 3—figure supplement 1), which was a major reason for our decision to proceed with chimeras. The increased F4/80hi cell numbers within the pleural cavity of C57BL/6 mice at day 28 post L. sigmodontis infection, was unchanged in the CCR2 deficient animals supporting our hypothesis of local expansion. An additional possibility, which may partially contribute to increased cell numbers is that in the context of infection fewer macrophages may be dying between d11 and later time points. In other words, even if proliferation is not higher than steady state levels at many time points, if IL-4 provides a survival signal and fewer cells die in that time frame, cell numbers would increase. We have made an effort to clarify these points in the text and data from CCR2-/- C57BL/6 mice has been included in the form of Figure 3—figure supplement 1B and C.
We too were surprised by the increased in BMD macrophage contribution between 23-25 weeks of age / 35-50 days pi. We don’t believe the difference is due to some artifact of the system because there was no significant difference between the two time points in the blood chimerism on which the data is calculated. The data instead suggests that during aging there is a point at which the contribution of monocyte derived cells increases sharply rather than being a steady accumulation over time. Bain et al. (2016) showed that replacement of pleural macrophages in naive B/6 mice is 25% at 12 weeks and 85% at 36 weeks, while we observe 45% at 23 weeks and 75% at 25 weeks. We hypothesise that there is a sigmoidal curve in which in the early time points there is a slow replacement of the resident cells with bone marrow derived cells and that this process increases sharply for a period in adulthood (e.g. 23-25 weeks) before leveling off near maximum. Consistent with this finding is unpublished data from Stephen Jenkin’s lab in which bone marrow from young mice were transferred into young (8w red) and old (37 wk blue) mice. There was a striking increase in the replacement of pleural cavity F480hi cells in the older mice vs. the younger mice. It is important to emphasise that regardless of the rate of resident macrophage turnover, our interpretation of the results still stand. The equal level of chimerism between naïve and infected animals at day 35 and day 50 supports the conclusion that increased cell number result from local expansion of F4/80hi cells and not recruitment of bone marrow derived cells. These are now provided in the supplemental data (Figure 3—figure supplement 2C- E). Any reference to trends has been removed. However, our re-analysis of statistics (as requested below) revealed that the there is a statistical difference in the proportion of GATA3+ CD4+ cells between the strains. We have changed the text but have been careful not to overstate the conclusions. We thank the reviewer for drawing attention to this discrepancy. The count of total T cell number was carried out on samples prior to stimulation with PMA and Ionomycin. Following PMA and Ionomycin stimulation, one sample consisted primarily of dead cells, as seen on the flow cytometer and evidenced in a very low event count in the CD4+GATA3+ gate (51 events vs. ~5000 for other samples). A threshold of 1000 events per gate was enforced in order to ensure a representative population was obtained. Consequently this one sample was omitted from the cytokine analysis. This statement has been removed. We apologise for initially using the wrong statistical tests in the analysis of the pooled data represented in Figure 5. The data in Figure 5 has now been re-analysed using ANOVA with experiment and treatment as independent variables. We verified that the residuals followed a normal distribution confirming that the models assumptions were met. We tested for interactions between experiment and treatment to confirm that treatment effects were not dependent upon experimental repeat (i.e. all repeats showed the same effect). – The significant treatment effect on worm recovery, F4/80lo, monocytes and% GATA3+CD4+ expressing IL-4 were maintained with this analysis. To give specific details for the data behind Figure 5C. There was a significant effect of treatment (MC-21 versus IgG) of p<0.0212. There was also a significant experimental effect (p<0.0178). However, there was no significant interaction between experiment and treatment (p<0.3216). This indicates that the different repeats showed significantly different baseline infection levels, but that MC-21 had the same treatment effect in each repeat (interaction was non-significant). Variation in infection levels between experiments is normal. Thus, there is a significant effect of MC-21 treatment on parasite burden. On reanalysis of the data from Figure 4, we found the data failed to meet the conditions for a parametric test, thus non-parametric Kruskal wallis test was carried out, followed by Mann-Whitney. Using this analysis, a significant difference in RELMα expression by the F4/80lo population between naïve BALB/c and naïve C57BL/6 was no longer observed. Outside of this, all previously noted difference held true. Furthermore, this analysis revealed a significant difference in the expression of GATA3 between CD4+ T cells isolated from the pleural cavity of infected C57BL/6 and BALB/c mice. The text and figure have been adjusted to reflect these changes. 14) It remains unclear from the text and Figure 3—figure supplement 2A and B, why the authors chose a partial irradiation of the mice, in which not only the chest and abdomen, but also the upper extremities were protected against irradiation. Essentially, this means that the recipient mouse has quite significant residual bone marrow activity, as hematopoiesis is not restricted to long bones of the lower extremities and also take places in the upper extremities, sternum, pelvis etc. In order to calculate the contribution of bone derived-macrophages vs. resident tissue macrophages to the cellular exudates in the pleural cavity, it would have been sufficient to shield the chest alone in order to minimize bone marrow activity derived from the recipient; the donor (BM-derived) and recipient (tissue-resident) macrophages can be distinguished just by the congenic CD45 alleles. We were restricted by the shield we had available. However, we fail to fully understand the reviewers concern. The level of shielding would not change the interpretation of the experiment. There will still be recipient bone marrow left in head and leg-irradiated mice, so instead of 30% chimerism one might get 70% chimerism. Although this may offer some additional sensitivity, the method of analysis would not change. Please note that an almost identical approach and level of shielding was used recently to identify the turnover of resident macrophages in skin draining lymph nodes . As it stands, the authors need to better specify and explain the contribution of CD45.2+ (derived from donor bone marrow) and CD45.1+ macrophages (derived from residual recipient bone marrow) to the macrophage pool in the pleural space. 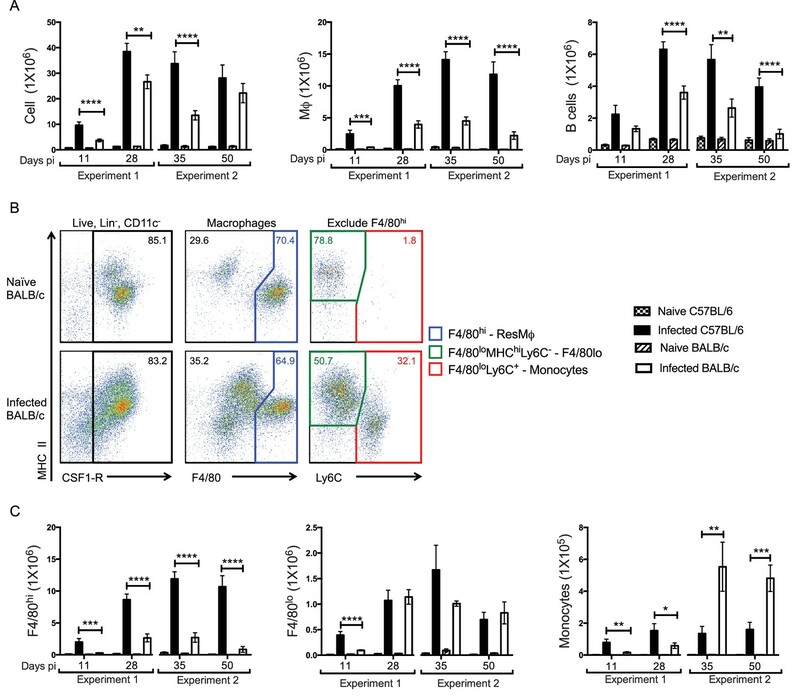 Most importantly, the authors wanted to establish, whether the increased F4/80high population at day 35 and 50 post infection was the result of local F4/80high proliferation or of a recruitment and conversion of monocytes into the F4/80high pool (subsection “Resistant C57BL/6 mice maintain the F4/80hi resMΦ population”, first paragraph). There is no clear answer to this question in this subsection, and probably also not possible due to the fact that recipient bone-marrow-derived macrophages expressing high amounts of F4/80 cannot be distinguished from F4/80high macrophages derived from the resident tissue macrophage population. We believe there must be some misunderstanding here. The use of shielded chimeras is necessary because pleural cavity resident macrophage are radiosusceptible (question below) and so would be replaced by bone marrow derived cells. By calculating the ratio of chimerism in the blood to that in the pleural cavity, we can calculate the bone marrow contribution to the resident macrophage pool in the steady state and during infection. Because the chimerism of F4/80hi+ macrophages in the pleural cavity does not change on infection (low BM contribution relative to the blood), the increase in F4/80hi cell numbers in the infected animals cannot be explained by enhanced cell recruitment (which would be indicated by higher levels of chimerism in cells from infected vs naïve mice), and therefore must be due to local expansion. We have added text to further explain why the shielded chimeras were necessary and included references to demonstrate that this is a well-established technique for this purpose [5,8-10]. We may have relied too much on published data rather than explaining this procedure in sufficient detail. Yes, it was already well established that peritoneal macrophages are replaced from the bone marrow on full body irradiation  but Stephen Jenkins has firmly established this is also true for the pleural cavity. In fully irradiated mice the chimerism of F4/80hi cells in the pleural cavity is identical to that of blood monocytes. 1) Taylor MD, LeGoff L, Harris A, Malone E, Allen JE, Maizels RM. Removal of regulatory T cell activity reverses hyporesponsiveness and leads to filarial parasite clearance in vivo. J Immunol 2005;174:4924– 33. 2) Taylor MD, Harris A, Babayan SA, Bain O, Culshaw A, Maizels RM. CTLA-4 and CD4+ CD25+ regulatory T cells inhibit protective immunity to filarial parasites in vivo. J Immunol 2007;179:4626–34. 3) Taylor MD, der Werf van N, Harris A, Graham AL, Bain O, Allen JE, et al. Early recruitment of natural CD4+ Foxp3+ Treg cells by infective larvae determines the outcome of filarial infection. Eur J Immunol 2009;39:192–206. doi:10.1002/eji.200838727. 4) der Werf van N, Redpath SA, Azuma M, Yagita H, Taylor MD. Th2 cell-intrinsic hypo-responsiveness determines susceptibility to helminth infection. PLoS Pathog 2013;9:e1003215. doi:10.1371/journal.ppat.1003215. 5) Jenkins SJ, Ruckerl D, Cook PC, Jones LH, Finkelman FD, Van Rooijen N, et al. Local Macrophage Proliferation, Rather than Recruitment from the Blood, Is a Signature of TH2 Inflammation. Science 2011;332:1284–7. doi:10.1126/science.1204351. 6) Jenkins SJ, Ruckerl D, Thomas GD, Hewitson JP, Duncan S, Brombacher F, et al. IL-4 directly signals tissue-resident macrophages to proliferate beyond homeostatic levels controlled by CSF-1. Journal of Experimental Medicine 2013;210:2477–91. doi:10.1084/jem.20121999. 7) Davies LC, Rosas M, Jenkins SJ, Liao C-T, Scurr MJ, Brombacher F, et al. Distinct bone marrow-derived and tissue-resident macrophage lineages proliferate at key stages during inflammation. Nat Commun 2013;4:1886. doi:10.1038/ncomms2877. in the Lymph Node. Immunity 2017;47:349–362.e5. doi:10.1016/j.immuni.2017.07.019. 9) Bain CC, Hawley CA, Garner H, Scott CL, Schridde A, Steers NJ, et al. Long-lived self-renewing bone marrow-derived macrophages displace embryo-derived cells to inhabit adult serous cavities. Nat Commun 2016;7:ncomms11852. doi:10.1038/ncomms11852. 10) Murphy J, Summer R, Wilson AA, Kotton DN, Fine A. The prolonged life-span of alveolar macrophages. Am J Respir Cell Mol Biol 2008;38:380–5. doi:10.1165/rcmb.2007-0224RC. 11) Merad M, Manz MG, Karsunky H, Wagers A, Peters W, Charo I, et al. Langerhans cells renew in the skin throughout life under steady-state conditions. Nat Immunol 2002;3:1135–41. doi:10.1038/ni852. The authors would like to extend thanks to Alison Fulton and Sheelagh Duncan for excellent technical assistance, Dr. Martin Waterfall for flow cytometry support and the University of Edinburgh veterinarian and support staff for excellent animal husbandry. SC was the recipient of a principal career development PhD scholarship provided by the University of Edinburgh. This work was supported by MRC-UK grants to JEA [MR/K01207X/1], MDT [MR/K020196/1] and SJ [MR/L008076/1]. Animal experimentation: All animal experiments were performed in accordance with the UK Animals (Scientific Procedures) Act of 1986 under Project Licenses (60/4104 & 70/8548) granted by the UK Home Office and approved by the University of Edinburgh and University of Manchester Animal Welfare and Ethical Review Body. Partial bone marrow chimeras were performed under anaesthesia (Ketamine/Medetomidine; 1/1; v/v) and every effort was made to minimise suffering. © 2018, Campbell et al.